The ListView control is similar to table with multiple list contain in column wise in Visual Basic 6.0. Views Type: Details, LargeIcon, List, and SmallIcon. This control shows the View property that represents the current view. First of All, We have to assign add Columns Header to the ListView. The columns can be add at design time as well as run time. You can apply through adding ColumnHeader objects. The columns will only be displayed only when this control is in Details mode. 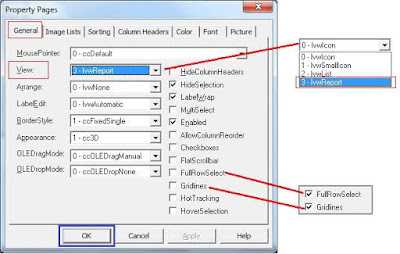 For more detail follow the link "Add Column Header in Listview in Visual Basic 6.0 Tips". For view data in grid lines with table format. Then, go to "Proprties" window and go to "View" combo in "General" tab and select '3 – lvwReport' option from it. For grid lines, check on "Gridlines" check box from "General" tab as shown In following image. 3 – lvwReport : It will show the data in table format with details. 'FullRowSelect' Checkbox : When you select any item, it will select full row. Whether clicking an item selects all its related sub-items. 'Gridlines' Checkbox : This will show rows and column containing grid lines. After applying above given setting click on "OK" button. Now, come to Form and drag 2 "Label" from ToolBox and set Caption as 'Name:' and 'Address:'. Then drag "TextBox" to Form from ToolBox. And set "TextBox" Name as 'Name_Txt', 'Address_Txt'. And drag "CommandButton" to Form1 and set "Command1" Caption as 'Add Data' and double click on "Command1" and type code in click event as describe bellow. We define Listview1 Name as "MyListdata"
MsgBox " Record Add Successfully"
'Msgbox: Show message after save Record. After completion of all given above process, run your application. As you can see in above image, when we type name and address in "Textbox" and press "Add Data" button. This process will show or add data in ListView with its related Header name through given coding. Copy code as mention above and paste it on click events of Command button. ListItems.Add : This will add data in first column in different rows. ListSubItems.Add : This will add data in second or more than one column in different rows. The 'SubItems' define the next column data for process. If you are new or beginner in programming with Visual Basic, then follow the steps just like I mentioned above. And as it is, I have coded it step by step. Now, The understanding tips to add Items in Listview dynamically at runtime in VB6.0 code with SKOTechLearn.